This post is sponsored. All products mentioned and reviewed on this page are compliments of AT&T. All opinions of the products are my own. It’s hard to remember the days before cell phones and the ability to call, email, or text any person at any time. Now, my 15-year-old can text me in between classes to ask me to check something in her room, my 17-year-old can email me from her college classes to have me look over a paper, and my 11-year-old can call me when she’s done with drama club after school and needs to be picked up. All from the convenience of a hand-held mobile phone. It’s hard to imagine being a mom of teens and tweens without cell phones. It’s funny to think that I hesitated to get phones for my kids for YEARS (just ask my oldest daughter, who was the LAST of her friends to get a phone), and now I can’t imagine living without them. My two middle school aged kids share a phone. It’s MY phone, but they have use of it, and it’s more for my benefit than for theirs (although they might argue that point). I am SO excited that their AT&T GoPhone now has a new rate plan available that offers even better prices for better service. *Data usage exceeding the high-speed allowance will result in reduced data speed of up to 128 Kbps for the rest of your 30-day term. Actual speeds vary by device and location. I love that there are so many GoPhone smartphones that are so affordable – that’s a huge plus when it comes to phones that kids have access to (I don’t know about you, but I don’t want to pay a bunch of cash for a phone that might be lost, dropped, and over-all abused by kids). But these aren’t “kid phones” – they’re smartphones that my husband and I like, too. But I also love that the GoPhone plans don’t require a lengthy commitment. Enter on the Giveaway Tools form below and good luck! The giveaway will end on 12/12/15 at midnight, after which a winner will be chosen at random and notified via email. It would help me because I would save money. This would be great for my dad. Who goes out a lot but doesnt have a phone. A go phone would help me communicate with my family and save me money. Would be great for staying connected with family and friends not to mention you should always have a cell on you in case you break down! This would really save me money. No contracts, I love it! With a son that just started work, this would help us to communicate! I often have to take my father to medical appointments. Having a phone would help keep in contact with the family at home so I can make arrangements for starting dinner, picking up kids, etc when we end up running late. This would be awesome be able to text hubby when I’m at work or on the go. I think it would be great to be able to reach my son during his walk to and from school and sport practices. A go phone would definitely help us save money and not worry about over using minutes! This Would Help My Family By Saving Us Money And Keeping Us On Budget. 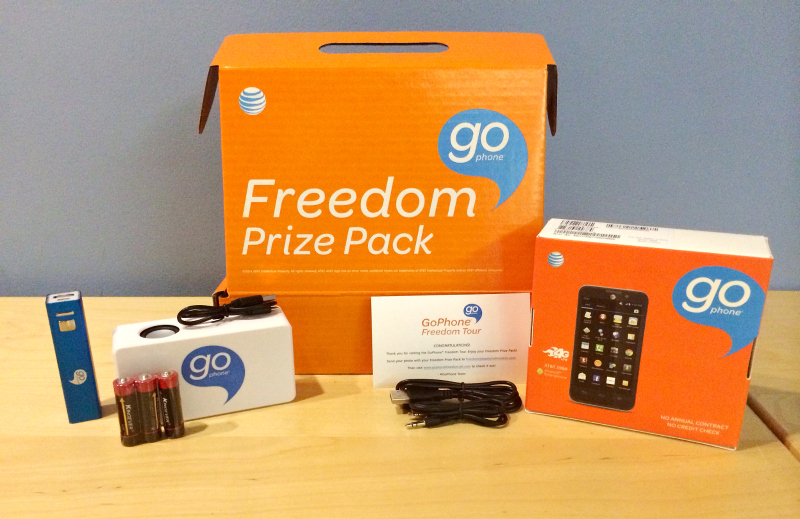 The prepaid service we have now is abysmal and I know the ATT GoPhone will be much better. I would win this for my daughter, who can take it to school. Unlimited data would be great for the entire family. We currently have overages often on our current plan. This would help me keep in touch with my 15 year old. We could talk/text without any worries about going over data. i have 4 children and we are always on our way to some sport or activity they are in. it would help us communicate when they are on the team bus and we are traveling to away games. A Go phone would help me keep in touch with my kids.